So you’ve chosen (or have a good idea) which feature you’d like for your garden and now want to figure out where it should go. Or maybe you’re undecided and would rather choose a suitable spot first before making that decision. Don’t worry, either which way is fine, we all work differently and this is about you and your garden, so it’s good to make the design decision very much your own, starting with the planning process itself. It might be that you’ve been inspired by a TV gardening show or a display seen at a show or online. Maybe it was a visit to a country estate that first whet your interest in water features, certainly such prestigious piles used to host a feature or several, as doing so signified status and wealth. Nowadays, you’re just as likely to pick up ideas from a friend or neighbour, as through modern technology and more accessibly priced materials, we can all tap into the many rich benefits of incorporating a pond, fountain or water wall into our back gardens. There’s a welcome and beneficial place for a water feature (or two) wherever we happen to live and however we like to use our precious outside space. Are you looking to redesign your whole garden, or just to add a feature within your existing layout? This is the first, most important consideration along with the practicalities of positioning such as: is there an outdoor plug socket nearby, and if you plan to position the feature reservoir underground, then are you sure it’s a safe place to dig? The section on safety below explains this in more detail. If it’s a complete makeover you’re after, then it’s worth considering using a water feature as a central focus and drawing plans with this in mind. For example, planning seating areas nearby, all the better to enjoy the view, and pathways positioned to lead to and from the display in all its glory will help reinforce its place at the centre of your garden universe. With additional LED lighting, it’s often the case that a feature can be enjoyed from various angles come day or night, including from inside the house itself. In this case, it’s worth walking around your garden and considering how you use it now, before thinking about where your new structure should go. There’s little to be gained from placing something so potentially beneficial in a rarely visited part of your garden unless it’s a birdbath which is more likely to be used by said feathered friends in a quieter corner. Otherwise, near existing seating, closer to the house, is often a popular choice. Of course seating can easily be moved about but most likely you already have it placed in the best spot. This is why working around what you already have makes a lot of sense so you can fully enjoy the hugely relaxing and entertaining benefits that a little piece of garden oasis is guaranteed to bring. As the previous chapter on solar vs mains electricity outlined, an outside power source isn’t always essential. It also partly depends on the type of feature you’d like and how you plan to use it realistically as to whether a solar-powered option would work for you. If you do require mains input then a waterproof outside plug socket is likely to be necessary. If you don’t already have one then an electrician will be able to install one for you suitably near to your chosen spot. However, the further away from the house that happens to be, the more work that this will most likely entail. This is why a lot of people have their features close to home, which also has the added benefit of enabling them to enjoy the visual spectacle from inside as well as out. Equally important to bear in mind is that if any digging is required in the installation of your feature, you’ll need to first check where any underground drains or electrical cables might be and make sure you dig away from them. If you’re not sure then it’s worth contacting your local service providers to check. Again, this often makes nearer the house a better option. The important thing when you decide where to install your water feature is power supply. Whether it’s a mains powered water feature with wiring to consider, or if it’s a solar water feature which requires direct sunlight, you need to think about it. If your feature will incorporate plants, either within (such as a pond in a bowl) or surrounding then a sunny spot will be necessary to enable the plants to prosper and grow. Avoiding an area with overhanging trees makes sense in the majority of cases as fallen leaves will create more work; falling in the water, potentially clogging the pump and landing on the feature itself. Also, an area close to trees will most likely have large roots underground which will make digging difficult and, over time, could cause damage to any buried reservoir as the roots widen and grow. 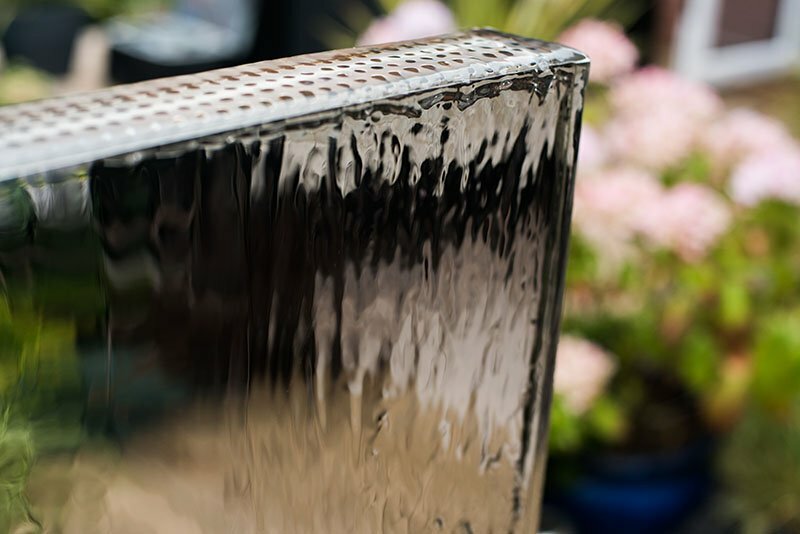 If you have noisy neighbours or can hear the sound of traffic nearby then a water feature with a stronger flow especially can be used to help draw attention away from the troublesome distraction and into the calming sound of the water. 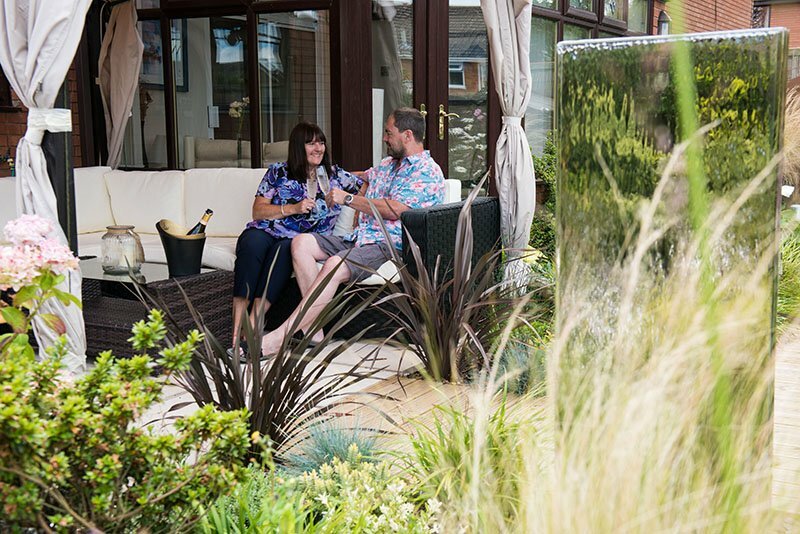 If this is the case for you, then positioning the feature furthest away from the source of irritation near to a seating area can be combined with the use of hedges or fencing and indeed internal garden screens to create a haven of calm in your midst. If you have an unsightly area of your garden, or your space overlooks something not quite so easy on the eye, then a large feature which commands attention can also be used to draw focus in and away. Additionally, some people use water, which often sparkles in the sunshine, to bounce light into darker, shadier areas of an outside space. While if you have a veg patch, then a little wildlife pond positioned nearby will be perfect for drawing slug- and snail-eating heroes such as frogs and newts right where you need them most. 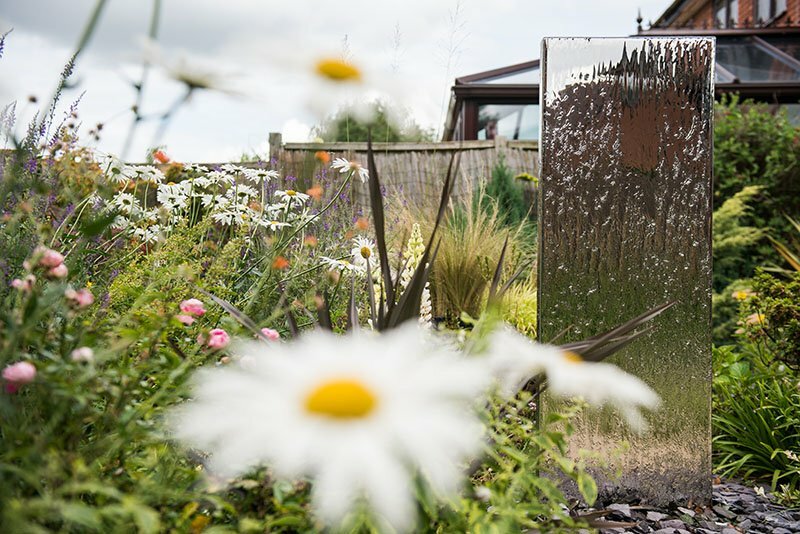 Their 4ft polished stainless steel wall has been given pride of place in the centre of their garden. Around it, they have added lights and created a central boardwalk with lots of shrubs, annuals and grasses which leads to three different social zones for eating, seating and entertaining. It has been designed in such a way that the feature can be seen and heard wherever you are. Their gazebo, which has heating and lighting, means the garden can be enjoyed whatever the weather. Inspired by the orient, the garden has an almost Japanese feel to it, especially in one of the zones where this has been made an integral part of the design. Plants have been chosen accordingly with the likes of Japanese acers providing the right aesthetic. All friends, family and guests love the feature which very much provides a central focal point to this garden. It also affords a great talking point and Paul’s sister-in-law likes it so much she is planning on getting one for herself. The stylish, modern design makes this a popular choice and has seen the water wall featured in many publications and on TV by way of popular ITV gardening show Love Your Garden with Alan Titchmarsh. It is extremely resistant to corrosion and therefore ideal for outdoor use in a range of settings. 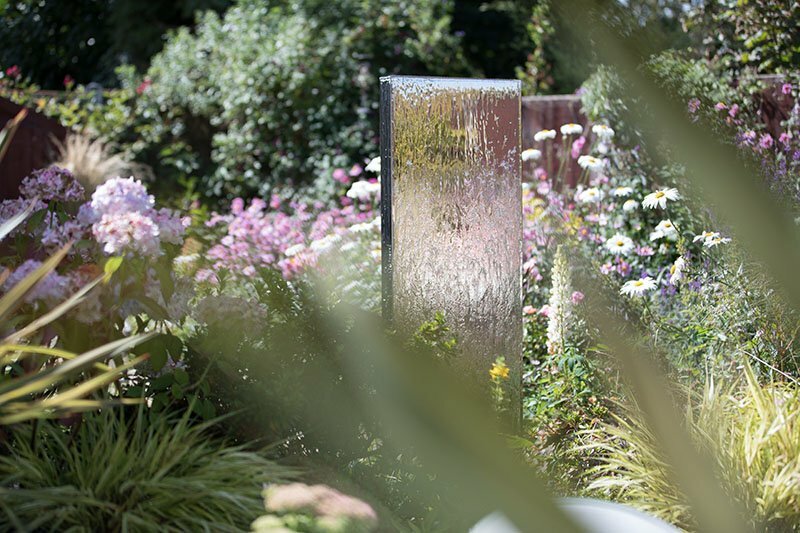 The water feature comes with a large 200 litre capacity reservoir which can be hidden underground, leaving only the stunning water wall visible to the eye. Once fixed into place, pebbles or slate can be used as an attractive, decorative display around the feature, still enabling easy access to pump and reservoir beneath. Made from only the highest-quality stainless steel (grade 304), which is the type used for hospital surgical equipment, it comes with a strong chromium content which reacts with oxygen to form a protective layer and which provides all important extra resistance to corrosion. Guaranteed to make a striking, contemporary addition to any outside space, the water catches the light as it gently cascades down both sides of the wall, creating a truly mesmerising effect.